Today's defence-related news includes coverage of the UK winning a £500m assignment to repair F-35 jets. There is various online coverage, including BBC Wales, UK Defence Journal, Wales Online and Daily Post. 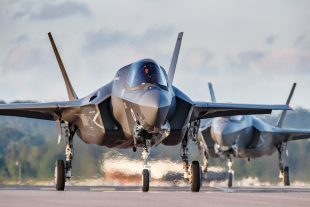 Reporting focuses on the award of the contract, writing that MOD Sealand will maintain, repair, overhaul and upgrade hundreds of F-35 fighter jet systems. Coverage adds that the assignment is expected to begin in 2020 and support hundreds of high-tech jobs. F-35B aircraft at RAF Marham. Crown copyright.